Camping at North Era in the Royal National Park. Hot, dry day. I got moving around 1pm with the idea of going for a swim at Wattamolla then spending the night at the North Era campground. Got lost a bit west of Cronulla; the road doesn't go straight to Hume Highway as I misremembered. Had lunch (a ham sandwich made at home) next to the memorial park in Sutherland, west of the train station, then some neenish tarts from the Suntop bakery and a coffee from the White Horse coffee house roughly opposite. I got to Wattamolla around 3.30pm. A view from a hammock. After that I rode over to Garie Beach and dumped the bike for the night at the carpark there. The walk to North Era is easy, along the (closed) coastal rocky track. I got there around 7pm to find the campground packed with two distinct groups of young people, and it took me a while and some light bush bashing to find some suitable trees on the southern hill (almost at the top) and set up. Sweaty as hell. Loads of cicadas. There were a lot of broken limbs from last week's storms. The beach was flat and definitely swimmable. A wallaby was grazing near the midden. The dinner I had frozen (chicken curry and rice) was still frozen. I set the fly up and crashed around 8.40pm. There is some 4G at Garie and nothing much at Era. A little surprisingly I slept poorly: I didn't bother with insulation and so got a bit cold when the wind blew, but not too badly; strangely my hip and shoulders got sore when on my side, which meant I had to keep turning onto my back all night. The dawn chorus (mostly cicadas) woke me to a beautiful morning around 5:30am. After breakfast and packing I got moving at 6:25am, arriving at Garie at 7am after an easy walk. I returned to Sutherland via Waterfall for a coffee at Salt and Pepper, and to wait out the peak hour. Tidbinbilla is not so cold in December. I set off for Canberra around 10:30am. The BP at Campbelltown ate some time. Lunch around 1pm at a rest stop in the ACT. I got to the NGA via Fyshwick, overshooting the turnoff due to a lack of signage (surprise). Blue Poles is still there, as is loads of explicit photography. Coffee at their cafe. Cartoons at Old Parliament House; the Museum of Australian Democracy in decline, Backbenchers Cafe no more. Sat in the NLA for a bit finishing off Peter Carey. Peak hour traffic to the Asian Noodle House on Northbourne. Their laksa is based on a thick (yellow?) curry. Tasty. Essen was closed. Gelato for dessert. BP in Braddon wanted $$$$ more for fuel than the Shell on Alison Road, Randwick. There is loads of motorcycle parking everywhere. I got to Woods Reserve Recreation Area around 8:15pm, perhaps 30 minutes before last light. One roo on the road, two at the grounds. All hopped off quickly. A couple was cooking at the facilties near the entry. I hurriedly pitched my tent on a non-flat bit of hardened dirt; a beginner's mistake due to the age since I last used it. Loads of hangable trees, but given my previous experiences I figured it'd be too cold. Well, I got a worse sleep than any I had in the hammock. 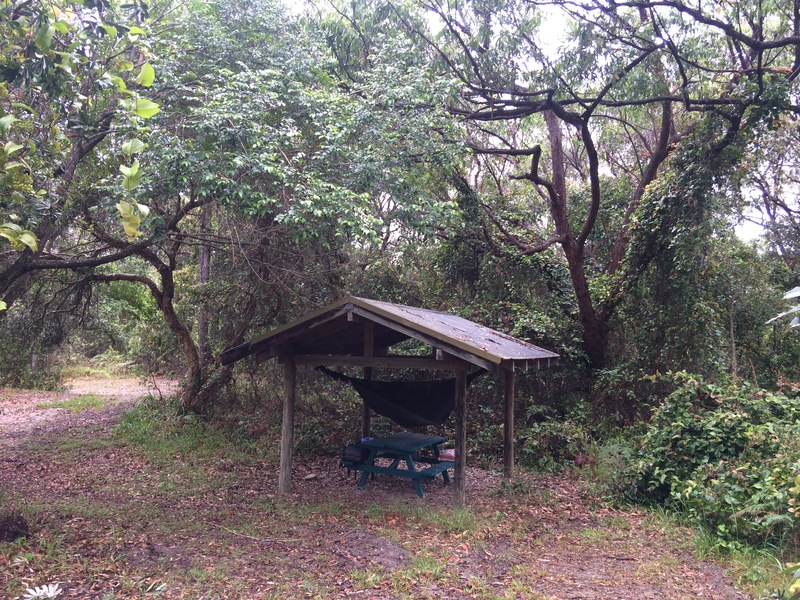 It's been many years since I was at this campground: it's no longer bookable and the amenities block is unlocked. (I remembered afterward that I had a plan to hang somewhere out of the way, closer to the city.) I woke with the dawn chorus at 5:30am-ish to a cool but not cold morning, with low cloud that burned off by midday. The shower is hot and remains on a three-minutes-on, two-minutes-off duty cycle. The ride up to ANU through the heavy morning traffic was easy. Woke up at 6am-ish. I slept OK once I removed the Therm-a-rest: it's too fat and inflexible for the hammock to work its magic. Live and learn. There were loads of mozzies and flies. Light rain: a few spots overnight then heavier around 7am as I was packing up. The walk out was painless. The CB400 was on its side though; that sand was just too soft. It wasn't too hard to pick it up and the only real damage was to the USB power thing that didn't fit together anymore. (It only took some mild renovation to repair in the end.) 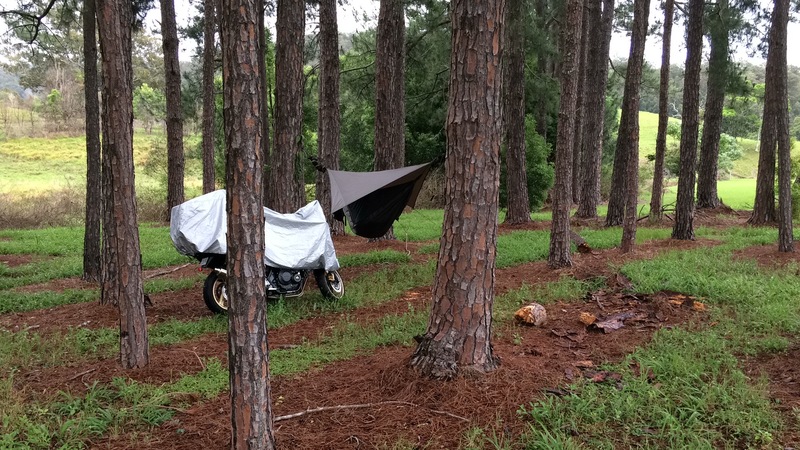 The ride back to Bulahdelah was a lot easier: does rain tame the gravel, or did I care less? A trio of Harley riders was having breakfast at the BP there. Humid. Soaked. Filthy. I stopped in at Morisset for a coffee. Retirees. Talk, endless talk: lots of lonely people? Library to burn a little time, with the idea of getting to Woy Woy for a fish-and-chips lunch at the wharf. Well, I took Woy Woy Rd (a beginner's mistake I now know) only to find the shop was closed for renovation! (Three days, Monday to Wednesday.) At a loss I went to the nearby pub and endured a room full of hard surfaces with kids screaming at each other, and oldies. Their $12 lunch special fried seafood was serviceable. After all that I manned up and rode straight home down the motorway. The trip was worthwhile. Did all up about 2350km. Less swimming than I hoped to do. Could have carried less clothing. Unlike Betts the CB400 was not uncomfortable at high speeds for long periods, at least once I got used to the wind. Fuel efficiency was poor, maybe 5L/100km or worse; the backpack and the panniers presented a lot of drag, as did I. It didn't break down in any way. No substantial damage to the bike (was that the gladwrap? ); just a few minor scratches due to the rock locksters and my carelessness. The luggage arrangement mostly worked. Didn't use the safety or wet-weather gear. Lost some weight; I guess I was cutting into my safety margin. The weather forecasts for the Northern Rivers region are generally poor. Spent 9 nights in the hammock. Guts held up just fine apart from maybe that trip to Maccas. I didn't sleep too well. I blame that on a poor hammock pitch: too high in general and in particular one end. The overall height matters because the angle of the tie outs on the sides matters. Live and learn. This meant I got an early start on the long road back to Sydney. The Telstra 3G was on the blink the whole day. At least there was reliable wifi at the Hat Head Holiday Park. A beaut day. I headed back towards Kempsey and took the Loftus Road down to Crescent Head, where I got a so-so flat white at Green Room Cafe & Fruit, opposite the country club; yes, there is a golf course on the headland. I had in mind to take the Point Plumber Road down to the ferry to Port Macquarie only to find that it turned to gravel maybe 10km from town. (It's the track to a load of beaches and campgrounds.) A stop-and-go bloke with a massive (Costa/Peter Russell Clarke) beard at the start of the section they were grading laughed and suggested I try the Maria River Road. Sealed? Sure. But it was the same: 10km then gravel. A driver coming the other way told me I had about 15km of gravel left, so I gave up and took Google's advice to go all the way back to Kempsey. None of the gravel is signposted ahead of time or noted on Google Maps, though I guess I should have respected its refusal to route me via those roads despite my best efforts to convince it. Hmm. Ultimately I would have got there faster if I'd just eaten the dust of that coastal track. All the locals were driving Landcruisers. I spotted the odd troopie. Had lunch with Dave in Port Macquarie. We aimed for "localvores" LVs but their service was too slow so we ended up at Carlos & Co Cafe. Later the well-travelled owner (she had lived in Stanthorpe and elsewhere) was adamant she'd never live in the country again after I told her of my Macksville experiences. It's a beautiful spot, though as I found on the Pacific and Ocean Drives to Kew it's a bit of a sprawling monster these days. Those roads are a little pretty but there's not much to see; I'm probably spoilt by this point. Hanging near the Hocking and Dees Trail in Myall Lakes. Back on the motorway I choked on the four-ish hour trip back to Sydney and figured Myall Lakes might make for an easy stopover; specifically Joes Cove Campground seemed like a nice walk to close out the day with. I got out at Bulahdelah and found a sign that said the ferry at Bombah Point was closed, so I called up the NPWS. The lady told me it was indeed closed for works but they were done for the day and it might be running again. She suggested she check but I thought I'd risk it. Well, after 15km or so of gravel I found that the ferry was indeed closed for three days (Tuesday to Thursday) but you won't read about that on the relevant NPWS webpages. Well, maybe with some digging. 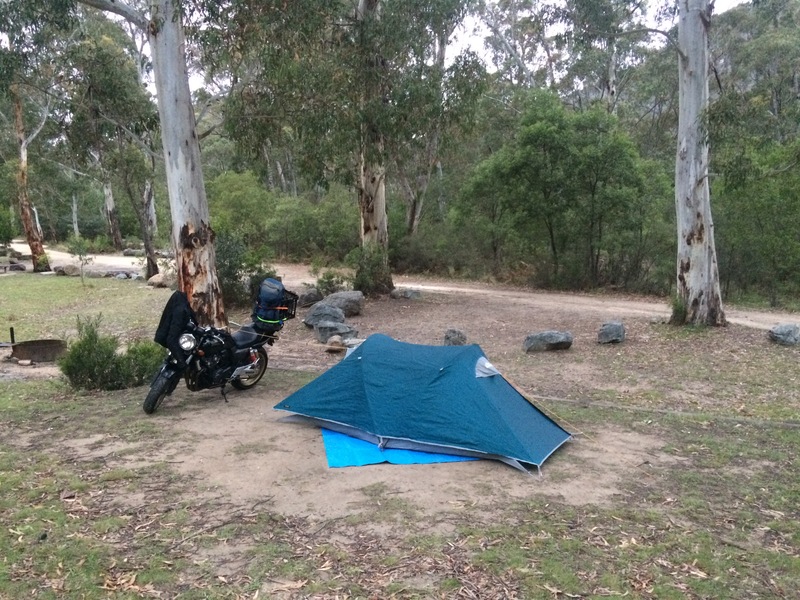 I wasn't going to pay a lot to stay at the NRMA Holiday Park, certainly wasn't going to ride back along that road today, so decided to camp in the nearest secluded spot, which turned out to be the Hocking and Dees Trail. I incautiously parked the CB400 behind a Forester on some soft sand, covered it, and with my pack and a light dinner proceeded down the trail towards the lake. There was a large gecko near the gate that ran up the first tree when I showed up. It took a while to find a site as things got a bit boggy in some places, and with the coming rain I wasn't sure how bad it was going to get. It got windy enough for me to check very carefully for dead wood in the nearby trees. It's a pretty spot but I was too buggered to figure out how to get into the water without getting super muddy, my feet cut up or boots soaked. Anyway, all up I did maybe 50km on gravel today for very little return. NPWS, WTF? Now I have 15km of gravel road to face tomorrow, rather than a nice trip along the coastline. Had a slow start. Took a (hot!) shower at the The Pub with no Beer (Taylors Arm) and waited for some stuff to dry after some overnight showers. 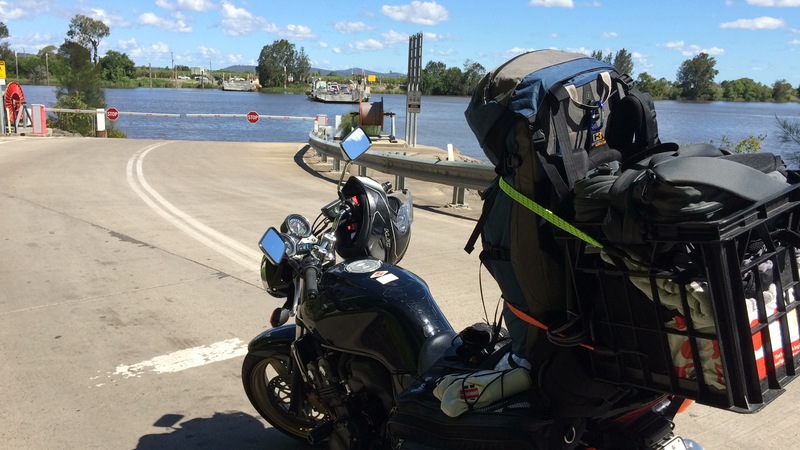 I headed back through Macksville to South West Rocks, more-or-less by accident. Along the way I encountered a bunch of blokes out touring on some larger motorcycles. The town itself is the usual fishing/tourist/holiday scene of this region. Coffee at Tasty Treats @ Back Beach ($$$). Ate my leftover pizza for lunch under cloudy but dry skies. Walked across the footbridge to the northern side: a mangrove swamp, sand dunes, some decent trees but a bit sparse. Flies. The local Shell doesn't take Coles dockets. Coles for food. On to the Trial Bay Gaol, which is a pretty spot with some tame kangaroos. 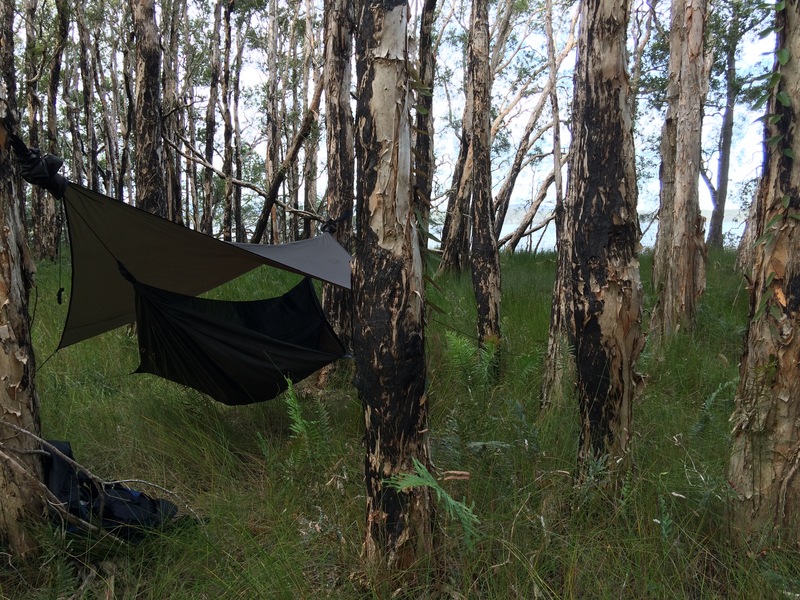 The NPWS wanted 31 bucks and up for camping, and told me I couldn't hang anything off their trees. Smokey Cape light house, beaut view. The sky cleared up for a beaut afternoon with a light cool sea breeze. Some blokes were 4WDing on the beach to the south. Continuing down the coast I headed to Hat Head with half a thought of camping somewhere. 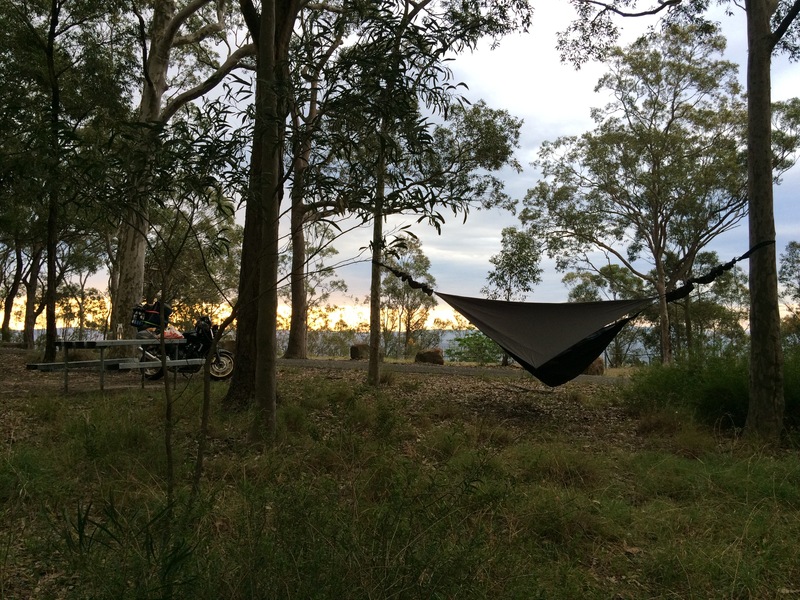 I ended up at Hat Head Holiday Park by happy accident: Kim was very accomodating about the hammock thing. (The only drawbacks of the one I picked — Site 224 — are that it's right next to the bowling club, which leaves its lights on all night, and it's a bit far from a functional amenities block.) I got in pretty late, with only enough time for a brief paddle, dinner, pitching; I was in bed by 8.20pm. No mozzies until dark. The mynahs there are as irritating as seagulls in Sydney. The 3G and local wifi is strong. I should perhaps go check the NPWS sites nearby. Rain overnight, clearing. The roof didn't leak which was fortunate as I hadn't bothered with the fly. Breakfast was the usual, and I climbed back into the hammock to wait out the continuing rain. Some people came and went to the beach, some with curious dogs, some to surf, but none commented. It's a beautiful spot. Eventually I packed up and got moving around 11:30am. Repacking the bike in the wet without a table nearby took some doing. Again at Christina's suggestion I headed to The Beach House Providore in Valla for a coffee and lunch (a Thai salad with bacon and eggs). The waitresses there were very accommodating: they sorted me out with electricity and wifi at a large table. I met Allan Turner — ex Leeton-ish, land and water conservation, now at Sawtell. He used to ride motorcycles but gave that up, and now has a black trike and will go touring with his wife. He tells me Nambucca and Valla are not yet discovered by the peoples fleeing Sydney. I set off to do my laundry at Bowraville along the Old Coast Road. The pub at Bowraville was open, as was the IGA. The locals were helpful: I got my tokens from the pub. There is a lengthy and nasty wooden-floored bridge on the way in on the northern side (on Rodeo Drive). The pub was open, as was the IGA; otherwise pretty much deserted. The locals sorted me out with some tokens for the machines, into which I put the clothes I was wearing too. A lady turned up with three kids in a huge Landcruiser; she told me she had a washer onboard but the water was too hard at the farm she’s staying at. I wonder how she does the drying. I popped over to the pub for a coffee (good; the bloke made it with cold milk for me) and caught a bit of the second half of the Wallabies v Italy game on their TV. There is strong Telstra 4G there. Camping opposite the pub with no beer. The plan was to camp at The Pub with no Beer (Taylors Arm). I headed there via Macksville, which Dave has said many dire things about; perhaps that it still has a Mitre 10 is observation enough. There's a wooden bridge on the southern side that leads to Taylors Arm Road. I felt I'd gotten lost (despite following the helpful signage) as one ends up on Boat Harbour Road, presumably because Taylors Arm Road goes to narrow twisty gravel. I was fortunate that the rain didn't start until I got to the pub, where I caught the tail end of Little Ripper Band's last set for the day: Wonderwall, Khe San, loudly. The lead bloke told a story about learning the latter's keyboard riff from Don Walker; apparently he played in a band that supported Cold Chisel in the early 1980s. I waited out the rain with the aggressively hospitable locals before setting up. Only Telstra 3G to be had. Returning to the pub I got a Murrays Dark Knight Porter (the only dark-ish beer on tap apart from Tooheys Old) and got hit up by the locals once again. It's farmland everywhere; historically it was more diverse than the present beef cattle and two remaining dairies. The stories got more provincial. One bloke remarked that we need to live seasonally once again, faulting city people for expecting to eat whatever whenever. I got a tasty Supreme pizza for dinner — the only thing going on Sunday nights. Two girls who were van camping came over to the pub to find out the deal. They quickly returned to their vehicle. After everyone left around 8pm, I got to chat with the present owner/lease holder. He has a sales background and a clear business plan: it's been 19 months so far of hard work. He told me it wasn't so difficult to deal with the locals if you’re not a local and you’re running the social hub. Nambucca is apparently full of drugs and crime. Avoid? Well... the middle of it at least. Macksville is a lot cleaner now, but he'd still prefer to be further away from the problems of town. I was in bed by 8.30pm. The rain around 4am woke me up. The forecast for this region is totally wrong. I slept pretty well. Breakfast was the usual Weetbix and UHT milk; I dunno if the AirBnB thing included breakfast, despite their name. Cloudy, and threatening rain, perhaps all day. Christina was about so we had a chat about her setup. She told me about learning to ride on a Honda Super Four (an earlier incarnation of my CB400) back in Canberra, which was for reasons unknown replaced by a BMW R100 that was too big for her to lift. 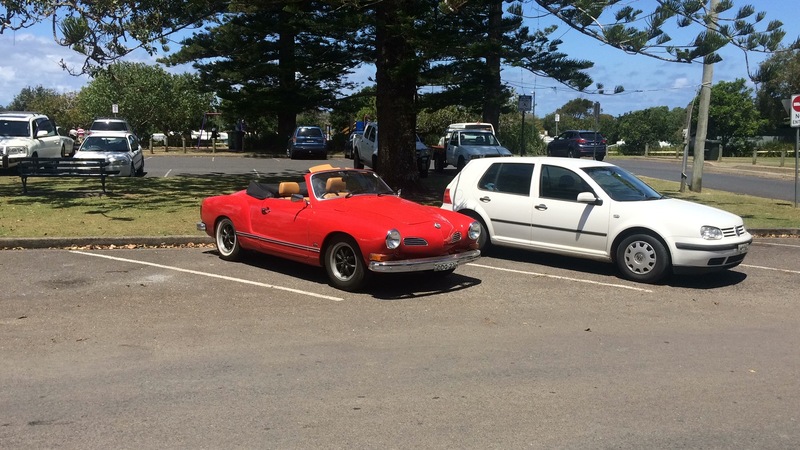 Shane's VW out front of the Ocean View Hotel in Urunga. At some point Shane got vertical and said he was going cruising in his car, so I invited myself along, leaving my stuff at Christina's on a no-responsibility basis. We headed down to Nambucca via the old Pacific Highway, now called Giinagay Way, aiming for Tasty Tucka on Bowra St, which does a fish-and-chips for $6.50. They don't know anything about salads. We ate that down at the beach, where a wedding party (blue at one gazebo, red at another) was just getting started. Beer and wine in abundance despite the signs. After that we aimed for a coffee shop in Urunga known to Shane, which was closed (on a Saturday afternoon! ), so we ended up at the Ocean View Hotel. Service was slow, and the coffee so-so. Great spot though. Somewhat scouting for a spot for me to spend the night, we popped down to Hungry Head, which is promising — there's pretty much only a surf lifesaving club down near the beach. The forests are beautiful here. Finally we popped into Valla and found the picnic ground that Christina had suggested. The signage is ambiguous at North Valla Beach — the 4WD says camping is prohibited on the beach, and another makes the nearby national park useless for my purposes, but there is nothing about that area itself. The picnic tables are perhaps 200m from the carpark, and reasonably distant from the houses. Conveniently there's a shower near the carpark with what proved to be potable water. Hanging in a picnic shelter. Shane took me back to Christina's, and I headed back to Nambucca to get some dinner (a marked-down "Asian" salad to go with some cooked (!) noodles and random snacks). On the way in a lady with a dog wished me luck camping there tonight, and around 5:30pm six young blokes (maybe mid teens) turned up with similar ideas to me. They set up ("Shouldn't have got the $12 tent from KMart") under another picnic shelter (one without a table) in a peaceable but shouty way. Later they moved on, probably down to the beach, where they would have copped it when the storm showed up. I got the feeling that the locals were well-used to the idea of camping here, whatever the regulations are. There were loads of black cockatoos and a few kookaburras. The picnic shelter was just a bit too short on the diagonal and I was scraping the table until I tightend the hammock beyond what I thought was wise; conversely the range of tie-off points let me put it in wide boat mode. The proper rain only started after the sun set; not too serious but a lot cooler. Surprisingly the beach had Telstra 4G, whereas Christina's only had 3G. The forecast of impending storms and hail and the rest made me doubt I could burn enough time in the region until Kate was back in Brisbane next Tuesday. Also Dave was heading up that way, so we agreed to meet up somewhere along the track. For these reasons I packed up at The Channon after another cold shower, and while waiting for the fly to dry out after last night's rain I got chatting with a lady who stayed last night with her husband in a camper truck across from me. The roadworks made for a slow and boring ride down the Pacific Highway to MacLean, where I met up with Dave. Given the forecast of storms etc., he suggested I try to find an AirBnB place near Nambucca, which took some setting up; after that it was easy to book Christina's Guunuwa, at least tentatively. I did all that after a big lunch (bacon, eggs, beans, mushrooms, bread, ...) at the Coffeeart cafe (same as going up). The owner-couple were very chatty: the Vietnamese chef is from Huế, and told me she couldn't get unground Vietnamese coffee shipped to MacLean. Her husband is a robust Aussie bloke who spent thirteen years in various parts of the country. The ride down to Nambucca-ish was windy but mercifully quick. I fuelled up at the BP south of Coffs Harbour along with loads of local boat owners. Arriving around 5pm, I introduced myself to the dog (who is always aggressively friendly but only barks at people he hasn't met) and only got to exchange a few words with Christina as she was heading off to Bellingen for a "five rhythms" dance class (until 8:30pm-ish). The house is a bit amazing: it's the old nurses' quarters from the Bellingen hospital, and there is so much stuff. 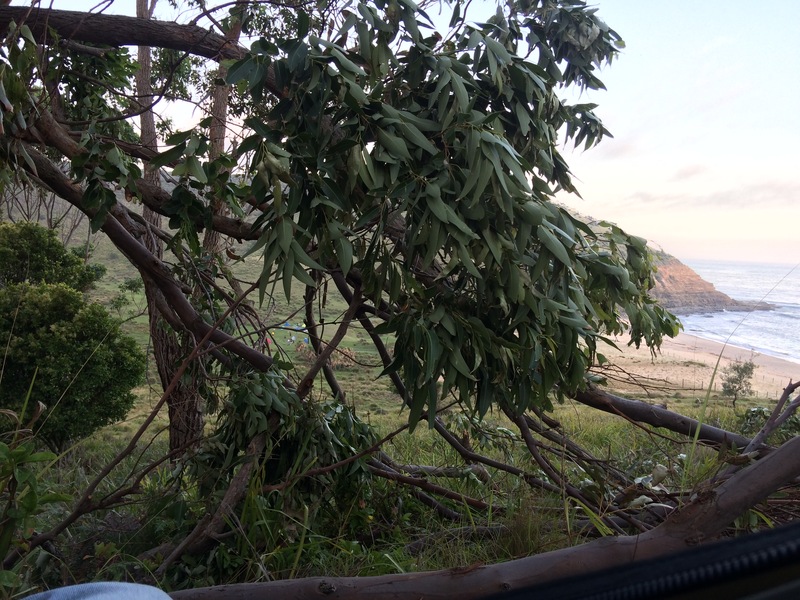 Notionally it's a macadamia farm. There are all sorts of plants here, and chooks. Very soon after I arrived I met Shane and Mick. Shane has been living here in a tent for a few months, working on his car (a classic red VW Karmann Ghia convertible) and other odd jobs around the place. Mick was gardening, and lives in Nambucca. Shane generously cooked us both dinner — bacon, fresh eggs, beans, i.e., the same as lunch — and provided a couple of Asahi cans to wash it down. The dog insisted I throw his ball around until I got wise and threw it where he couldn't find it. One of the long haired cats caught a rat. I crashed at 9pm and got to sleep by 10.30ish. Again I got moving around 9am after breakfast and a cold shower — easy once in, but moving water is harder to endure than still. The ride to Bangalow via Dunoon, Corndale and Bangalow Road is pleasant, as is the coffee at Our Corner Kitchen. I'm pretty sure I've been there before, back when the Pacific Highway ran through the town. I continued along Bangalow Road to Byron Bay; it also runs south to Ballina in the form of Broken Head Road. Byron Bay is a horrorshow. It starts with the heavy traffic, and continues with the parking: I was lucky to find a two hour spot at their library, where I could charge up the laptop and catch up with the internet. A massive troopie parked next to me. It was hot and humid and packed with (foreign) tourists: Byron is no more than a brand now. The fun continued with finding some food — I got a pork-and-fennel sausage roll, a salad and a coffee at Sunday Sustainable Bakery. Afterwards I had a pleasant, almost idyllic twenty minute soak at Byron Beach, then sat on the grass behind the dunes and read more book while drying out. Three blokes touring on BMW R1200s were having lunch somewhere there. I headed back to Lismore along the Lismore/Bangalow Road. Looking to burn a bit of time before dinner, I took a look at the sprawling Southern Cross University campus there. It was pretty dead — perhaps the students are already done for the year? — and seems to have no serious computer science. The library has a very squeaky floor. Had a caramel milkshake while scanning the internet some more. Heading back into town, I had in mind to have find some Indian food, ultimately settling on a thali at Little Delhi. The curries where small, watery and somewhat tasty. There was a farmers' produce market on Magellan St that afternoon, and many oblivious locals swarming about. Back at the The Channon Village Campground, I was in bed by 8pm. It was raining by 10pm, but not seriously. The hammock's fly worked fine. I didn't bother covering the bike. The cool breeze was very welcome. A koala in a nearby tree got really vocal. Got up at 8am after a pretty good sleep; the Therm-a-rest made all the difference. This was after being woken up at 6am by Carl heading off to work, and the dawn chorus. The shower turned out to be bearable. Breakfast was the same-old. I left the hammock up as I had in mind to stay a few days. 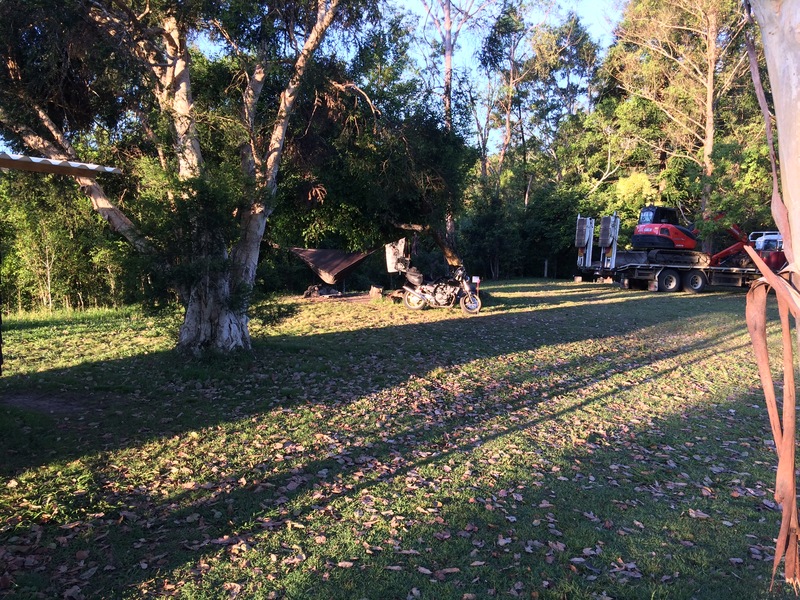 Around 9am I headed off to Nimbin in a dutiful sort of way along 15km of windy narrow road. It got a bit horrorshow at some points — quite a few blind corners, no posted speed limit, concealed driveways and so forth. Fortunately I didn't encounter anyone really in a hurry. Had a coffee at Dutch & Co. Their wifi works fine. Dave told me that about 50 people have been arrested for dealing in Nimbin recently, which might explain why I only got hit up twice on my brief wander around the town. It seemed about the same as when I was last there about fourteen years ago. Later Hugh set me straight: the museum burnt down a few years back, taking with it just two other shops, which was unexpected as the whole main drag are wooden buildings. The hemp advocacy seems more anachronistic than ever. I ran into Carl, and on his suggestion had lunch at the the bakery opposite (presently for sale), then back to Dutch & Co. for another coffee. 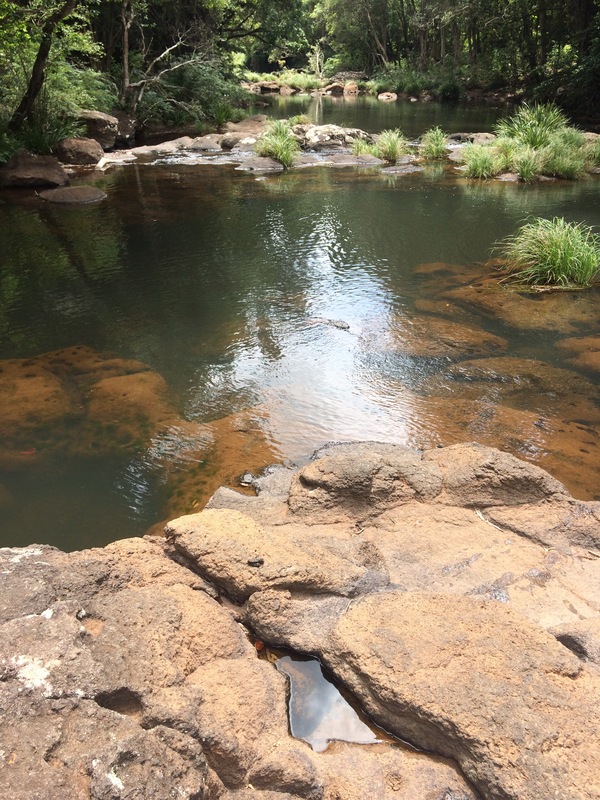 Downstream from Whian Whian Falls. I headed back to the campground to collect my swimming gear, aiming for Whian Whian Falls near Dunoon. Along the way I saw Carl just as he described the day before: sitting on the side of the road with the digger unloaded, waiting for the blokes who make the big bucks to decide what to do. The falls are on Rocky Creek, which runs south of The Channon; Terania Creek runs to the north. It's a beautiful spot. Several kids in several groups came and went while I was there. Pleasant in, and seemingly clean. It has a no-dogs policy that works just like the one at Gordons Bay. Around 4pm I headed up to Rocky Creek Dam for a walk along their "Cedar" route, which includes the spillway. The regeneration of the rainforest is pretty amazing. Afterwards I had dinner again at The Channon Tavern: a not-great fisherman’s basket, which I now know means fried battered seafood. After a day of slow riding on the narrow winding roads, I crashed early at The Channon Village Campground again, and tried to read some more Peter Carey. I was hot going to sleep but got a bit cold early in the morning; these hammocks really do need insulation, even with temperatures in the high Celsius teens. It's still hard to find the right posture. It probably helps to be exhausted. The dawn chorus woke me up. Breakfast was once again Weetbix with UHT milk and a carrot. Packing up was easy (snakeskins and just stuff everything into the pack). I schlepped back to the carpark in maybe 90 minutes. The CB400 was still there and looked unmolested. I rode to Ballina directly through loads of roadworks. Had a Byron Bay Coffee Company coffee at Burntwood Cafe and Pizza, Woodburn, on the Richmond River. Ballina has 2P motorcycle parking on its main drag (River Road), where I had lunch: a pie and sausage roll at a bakery, after which I caught up on the internet at the town library. I had in mind to go for a snorkel at Shaws Bay but ended up settling for a soak as the water didn't seem especially clean. The locals were blasé about that, and chatty. The Channon Campground, and Carl's earth moving equipment. The road to Lismore was chokkas by mid-afternoon. It reminded me a bit of Việt Nam: a big sprawl along what once may have been a highway between distinct settlements. I had another coffee at Rainbow Wholefoods (earnest but not great; they charge for water?!?) on the way to the turn to The Channon (and also Nimbin). That road is not so bad. I got lost in the village itself because I wasn't aiming for the right thing: The Channon Village Campground is at one end, and the Tavern at the other. This is a beautiful spot. The campground is the front drive of a small beef cattle farm that is ringed by two creeks and the main road. An unpowered site is $10 a night. Owner Hugh has a hammock and was keen to chat, kindly helping me find a suitable pair of trees. (His son in law is an arborist and hangs hammocks high.) I later met his wife Nan; together they have done a lot of work on rainforests, some of it recorded by their Terania Rainforest Publishing. After setting up I had a chat with Queensland Kiwi Carl who owner-operates an excavator on contract. He's got a sweet setup (sleeping in his cabin, carrying loads of comforting things, being on the clock whatever the local disorganization) but it takes him away from his family for long periods. He pointed out a koala in a nearby tree: it seemed a long way out on a fairly thin branch. The shower was too cold for him to use. There are no picnic tables but plenty of things to sit on. The water is apparently from town and proved safe to drink. I had a decent steak for dinner at the Tavern, and passed out around 10pm after reading some more of my book. On the Blue Point Ferry. Dave had a 4am curtain call for a film some acquaintances were shooting (on 35mm of all things). When I got up he'd been and was waiting for the next one. 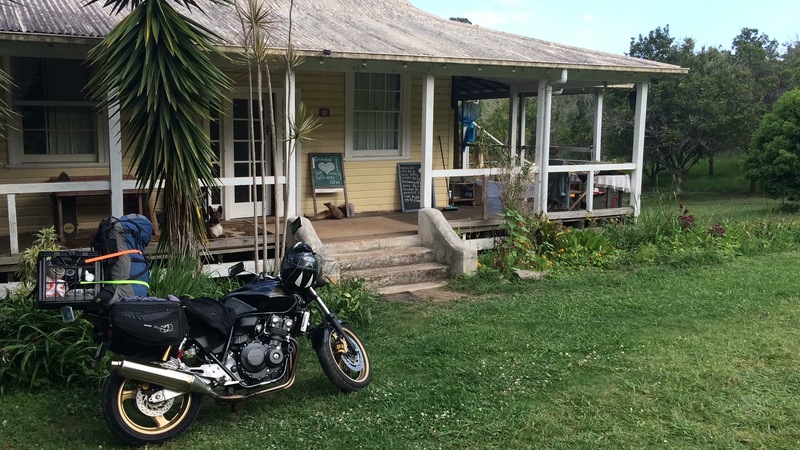 I packed everything on the CB400, which took a while, and rode up to Grafton. Lunch at the Grafton Hotel (the wagyu beef, salad, chips lunch special; there are loads of pubs here), then wandered around town a little bit. I took the scenic road along the river to Lawrence (with a side trip along a kilometre or two of the road to Everlasting Swamp National Park), crossed the Clarence River on the Blue Point Ferry, and proceeded to Yamba. It's a beautiful ride. The bloke who runs the Coffeeart cafe in MacLean with his Vietnamese partner told me the river is unswimmable due to bull sharks. 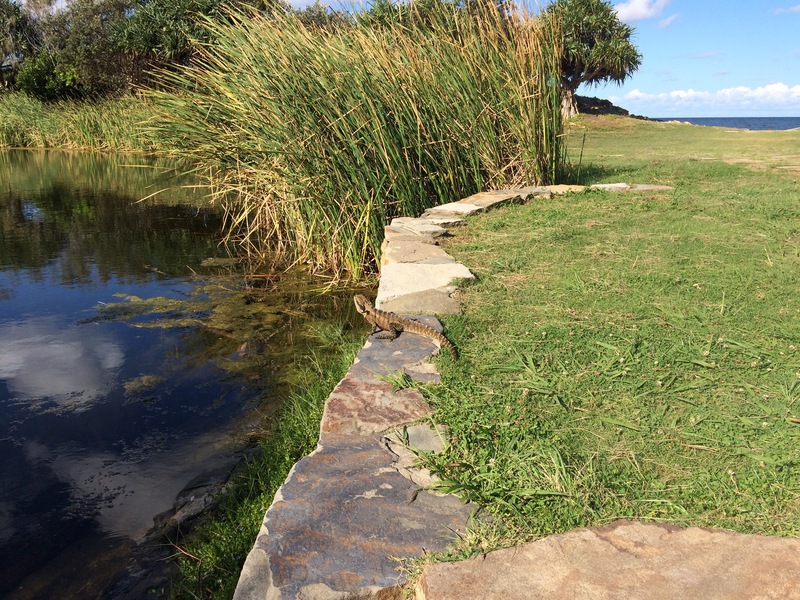 A water dragon at the Blue Pool, Angourie. I was hoping to have a soak at Yamba. The lady at the info centre there didn't know anything about snorkelling, and the nearby beach was a bit open and rough. The Blue Pool(s) at Angourie is quite a pretty spot, but the signs warn of sharks (!) and algal infestations, so I didn't get in. 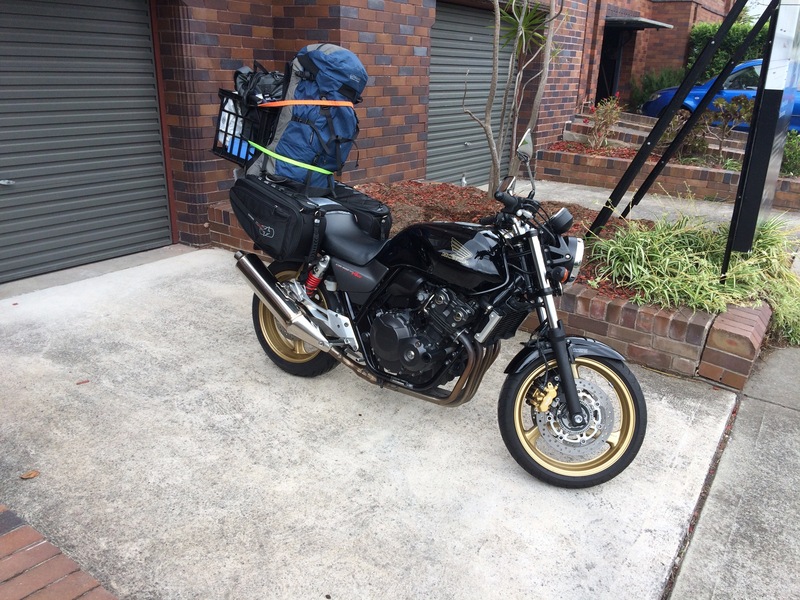 I headed to the Mara Creek Road and left the CB400, covered, for the night in the NPWS carpark, then walked the approximately 5km directly south with my lightly-loaded backpack to the Shelley Head Campground in the Yuraygir National Park. The track is basically a highway along what I'm told is the longest unspoilt coastline in NSW with some very moderate inclines and loads of roos hanging around. Two blokes were going for a fish after work, off the rocks just south of the beach near the carpark. The campsite is relatively huge, and probably because it's walk-in only, I was the only one there. 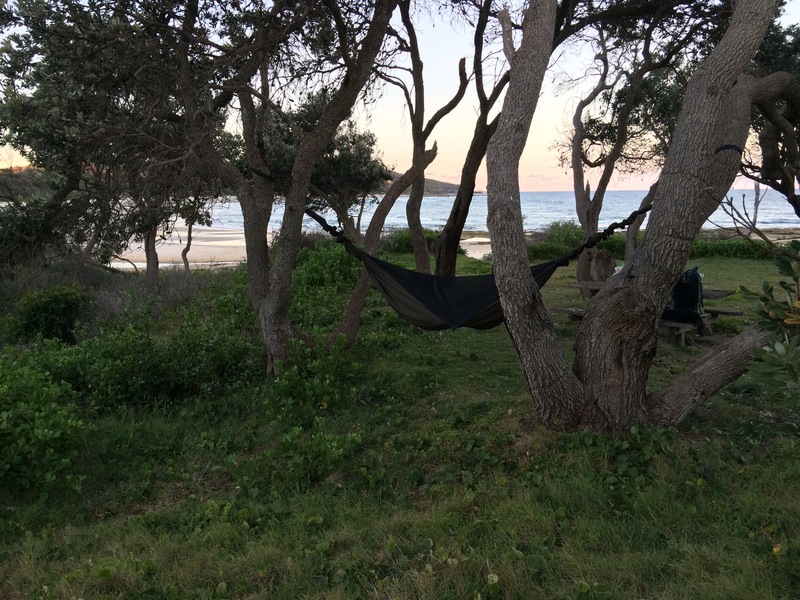 I pitched the hammock wider and deeper than I have been, right near the northern entry point next to a picnic table. Dinner was some instant noodles softened with some cold water (worked fine), a carrot and two tins of flavoured sugared tuna. There were loads of bright stars later on, after the moon set, but I didn't really get a sense of the Milky Way. Another lazy day in Coffs Harbour. Went shopping with Dave over on the north side. Officeworks there was closed due to a fire. I stocked up on groceries with the intent of getting moving tomorrow. Lunch at Park Beach (a decent pie and sausage roll from Gibbo's Famous Pie van). Later a trip to Jetty Beach. Dinner was at The Spare Room Sawtell which was hosting a jazz band. After we rounded out all three seasons of Rick and Morty. Lazy day in Coffs Harbour. Lunch at the Fishermen's Coop: some not-great flathead tails, a small salad, too many chips. Coffee at Element bar. Some trip planning. Pad Thai for dinner at Thai Tales in Sawtell. Dave had a DJ engagement at a dance night at the Mexican restuarant there. I went for a walk along the main drag, through the street party, then rode back to Coffs Harbour to watch a few more Rick and Mortys. Slow start. Malcolm Turnbull on Q&A. Lunch at Ootoya sushi on the shopping strip on Coffs Harbour with Dave. Their seaweed salad is OK. Rode up to Bellingen for a look see. The road down to Gleniffer and Promised Land is a bit narrow and eventually unsealed, so I wimped out on doing the loop road. Coffee in Bellingen, wandered around, back to Coffs Harbour. Dave and I went for a long walk along Jetty Beach and out to Mutton Bird Island (cf The Season), then Maccas for a late dinner. Lazy day in Coffs Harbour. Walked down to the Coffs Creek, through the mangroves. Lunch at Supply with Dave, later Esther joined for a coffee. Read book. No rain, just some thick clouds. Dinner at home, a few Rick and Mortys later on. Poor sleep: Coffs near the coast is on the flight path! Late start. Cleaners. Dave and I went to Sawtell to catch the midday session of Bohemian Rhapsody and some lunch at the same fish and chips shop as near the beach. Dave went to his tango class. I drove Bonnie over to Bunnings and by accident Coles during a heavy storm which didn't last too long. Afterwards pizza at Fiasco with Dave, Rob, Esther from Dave's tango class. Beaut day for the most part; so much for the BOM forecast. Sleeping on Mt Sugarloaf was a bit tough: difficult to find the right position, and the mosquitoes were really noisy. Breakfast was Weetbix and UHT milk that I now know doesn't keep after opening. Tear down is heaps quicker than setup. Had a so-so pie in Nabiac for lunch. Thought about going to the National Motorcycle Museum but their $15 entry seemed too much. I proceeded on the long ride up to Coffs due to threatening rain, stopping off every hour or so. Humid and hot. The buffeting winds settled down closer to Coffs and it wasn't too hard to get the CB400 up around 110km/h for some lengthy periods. Somewhere I got overtaken by a formation of Veterans MC riders on Harleys. Met up with Dave at his place. He opened the dance place for some oldies, after which we went for a soak near the Coffs Jetty and had dinner at the nearby fish and chips, then seven episodes of the Maniac Netflix series until 2.30am. Set off at 1.15pm after an extended period of packing. This involved gladwrapping the plastic parts of the CB400, at the rear around the seat, in the hope of preventing the panniers and straps from destroying them. I gingerly tried to find a place to carry the plastic 5L water jerry can; at capacity it was too heavy for the milk crate and sloshed around too much for comfort, so I half-filled it. 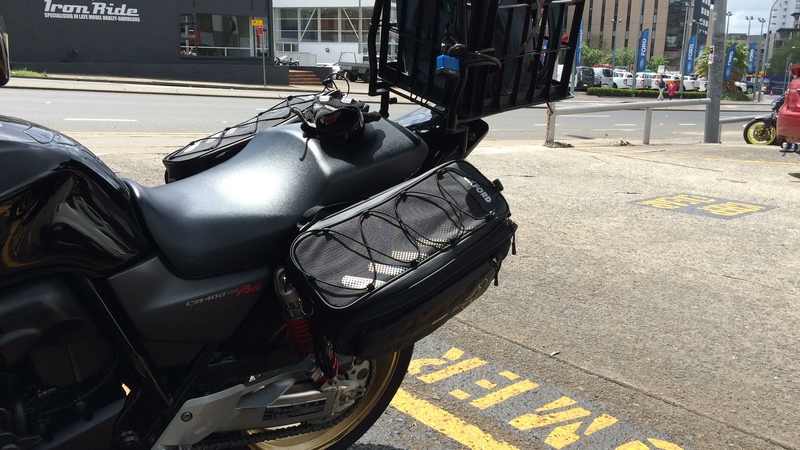 I roughly split stuff up between the panniers, hoping to keep the wet-weather and safety gear handy. All the camping gear went into the backpack. Got to Woy Woy fairly quickly, but went to the wrong fish and chips place, Barry's; I'll know to go to the wharf next time. Fueled up at the BP in north Gosford. Got a bit lost on my way to Mount Sugarloaf State Park, which is pretty much directly west of Newcastle. The JJJ antenna is there, and much rubber has been laid in the carpark near the toilets. Loads of picnic tables, some in strange places like right next to a big dustbowl/circlework/pseudo-carpark. The roads radiating from the mountain are not marked, just warnings that you might need a 4WD and experience to get places. I pushed the bike past a locked gate, down to a picnic table next to the lookout; not much of a view due to the haze and cloud. There was no one else around. Dinner was just some snacks, a banana, some tinned tuna. Got a few spots of rain after setting up the hammock between a pair of ironbarks which may have been a bit too far apart. 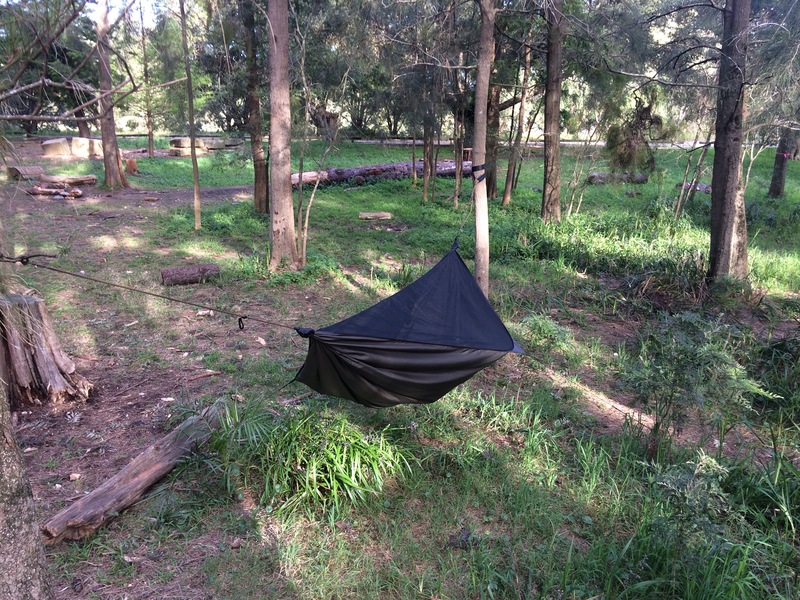 The fly worked fine: I attached it to the hammock supports, and the shock cords I added to the guylines did the job. Not very comfortable: maybe needed to push the tree huggers higher, and peg out the sides a bit further. There were loads of mozzies; a couple got in with me, millions did not, but I needed ear plugs to sleep as they just hung around all night. Too knackered/lazy to read much of my book. Later in the evening I could see the lights of the various small towns west of the mountain, and the high voltage lines. I forgot to check my packing list. Even so I brought everything except some pegs, which might have been handy for drying clothes on the hammock lines.